Happy 2:09am, or is it 3:09am? Maybe even 1:17pm next Sunday? Possibly pi o'clock? Maybe even tooth hurty? Actually, it's all of these, because I have decided to boycott Daylight Saving Time this year. Everyone knows this accursed holiday is a strong arm tactic by the clockmaking industry to get people to buy new clocks, increasing the companies' bottom lines. How many times has the first Sunday of November (or ninth Wednesday, whenever the hell they do it) rolled around and faced with the arduous task of holding one button while pressing another button 23 times, you just threw away the clock? Lord knows I've done that on many occasions, and it's not uncommon for others to do it as well. In fact, the landfill outside of Alamogordo, NM is known as “Lost Time,” because it's filled to the brim almost entirely with alarm clocks. Really this is a massive waste of time, but it's what the clockmakers deem necessary to make the hands go round, so they force it through. Really the saddest case study involves Indianapolis, IN. For the longest time, this fine city held up to the repeated inquests of the clock industry lobbyists. It bravely faced intimidation, bullying and withholding of cheese, but the city remained strong in its opposition. When elected mayor of Indianapolis in 1884, John L. McMaster immediately attacked the clock industry for its repeated attacks upon the city. However, he soon just vanished off the face of the earth. And I'm not talking like he got run over by a perpetually late train from Ft. Wayne, but vanished as in never seen again. Soon after McMaster's disappearance, the clock industry launched one of its most successful products ever in the Longcase clock, AKA the “Grandfather Clock.” It's no surprise that one of the first recipients of said clock was McMaster's grandson, Nellie. Now, I'm not saying evil clockmakers callously diced up McMaster's bodies and put him into a horrorific namesake clock, but really, evil clockmakers callously diced up McMaster's bodies and put him into a horrorific namesake clock. Although I don't really fault them, I mean nothing keeps time like human intestines. Another aspect of Daylight Saving Time that really gets me is this whole ridiculous “Spring Forward, Fall Back” nursery rhyme. Have you ever met someone who has actually fallen backwards? Wait, let me rephrase that, have you ever met someone with a fully functioning brain (both hemispheres) who has fallen backwards? I can already assume the answer is “No,” because you're not going to ask someone who just had a potentially fatal fall what their brain disorder is. My argument wins by default. I do know perfectly normal people who have fallen forward, even some who have springed backwards. It's not all that uncommon and would make for a much better, much more logical statement. Even if they did do that system, I'd still boycott it, because all Daylight Saving Time shifts are going to be ignored from here on out. 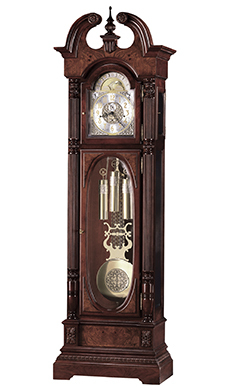 My Grandfather Clock will be ahead of yours for the majority of the year, and that means I'll always be earlier than anyone else to pressing events. When people see how prompt I am, they just might (will) join my revolution. I look forward to having you.